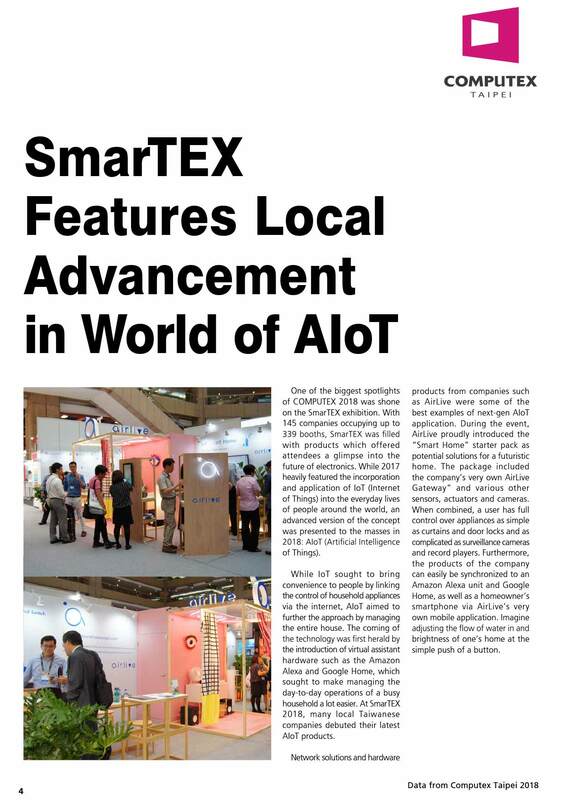 One of the biggest spotlights of COMPUTEX 2018 was shone on the SmarTEX exhibition. With 145 companies occupying up to 339 booths, SmarTEX was filled with products which offered attendees a glimpse into the future of electronics. While 2017 heavily featured the incorporation and application of IoT (Internet of Things) into the everyday lives of people around the world, an advanced version of the concept was presented to the masses in 2018: AIoT (Artificial Intelligenceof Things). Network solutions and hardware products from companies such as AirLive were some of the best examples of next-gen AIoT application. During the event, AirLive proudly introduced the “Smart Home” starter pack as potential solutions for a futuristic home. The package included the company’s very own AirLive Gateway” and various other sensors, actuators and cameras. When combined, a user has full control over appliances as simple as curtains and door locks and as complicated as surveillance cameras and record players. Furthermore, the products of the company can easily be synchronized to an Amazon Alexa unit and Google Home, as well as a homeowner’s smartphone via AirLive’s very own mobile application. Imagine adjusting the flow of water in and brightness of one’s home at the simple push of a button.